Issues from maintenance problems with heavy industrial and multi-million dollar manufacturing equipment can cause hundreds and thousands of products to be delayed in production. Graphtec dataloggers offer handy portable trouble-shooting tool for testing and monitoring electrical signals from expensive industrial equipment. From condition monitoring to life cycle testing, embedded Graphtec solution can offer multi-various inputs displayed in large format with easy-to-handle data from complex data acquisition to simple thermal verification processes. Rapid installation of the test platform can offer in-depth diagnosis of CNC machines, presses, rollers, mills, and even tractors and 3D cutters and printers. Monitoring long term condition of heavy equipment can also offer analysis on asset conditions and motor performances to measure durability and uniformity of production and manufacturing. Protect your asset with Graphtec dataloggers to measure and to prevent failures and catastrophic events. GL7000 records dynamic temperature profile at fast sampling speeds to monitor injection molding process for temp and pressure. Various other signals can be considered using varying amplifier modules. Concrete compressive strength test can be done using a strain gauge measurement conditioner along with the displacement transducer to measure the amplitude of the two signals on the GL980. 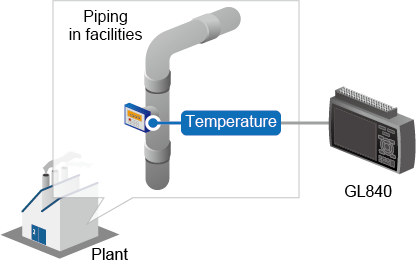 Monitor multichannel of temperature points for industrial piping systems within a manufacturing plant. PC measurements of multiple refrigerator temperature points can be measured up to 500 channels via LAN. Measure refrigeration units up to 10 channels and record data onto the SD card for quick post process checks on their performances. Measure the decay time and ion balance measurement using measurement values from balancers and controllers to display and record time-stamp value on the GL240.